Right near the Upper Hutt City centre but also very close to SH2, this playground has something for kids of all ages, making it a great destination playground or stopping off point before or after a trip over the Rimutaka Hill Road! For older kids there’s one of the biggest space nets in the country, twin long flying foxes (60m) and twin long slides so you can challenge someone to a race on either of these. There’s a rocktopus, a sort of roundabout with a rope net for climbing as it’s spinning and some challenging obstacle courses with monkey bars. There’s also a very big skatepark (1000 square metres) just next to the playground. For younger kids there’s a section of playground with equipment more suited to preschoolers. It’s not fenced off but it is in the section of playground furtherest away from the main road. There are swings and a structure with a tunnel, mini slide and things to climb on it. There’s plenty of seating around the park including picnic tables and a free BBQ. There’s no shade over the playground equipment or skatepark so on sunny days, you’ll need sunhat and sunblock. Some of the seating is near big trees which will provide shade at certain times of the day. Address: The playground is best accessed from Park Street, Upper Hutt. 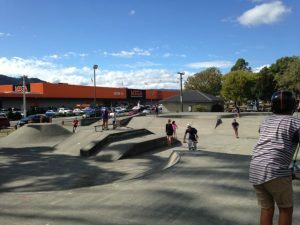 There is street parking right next to the skatepark and playground, opposite the Mitre 10 Mega.